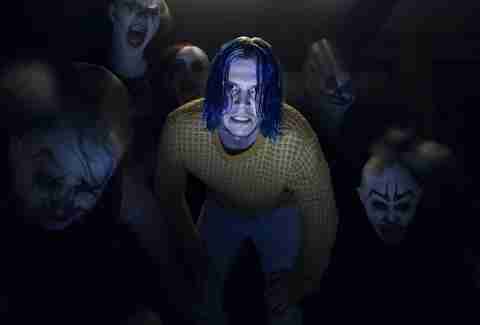 American Horror Story: Cult isn’t afraid to court topical and controversial real-life incidents in an attempt to rile viewers. To some, this may sound like a tasteless exercise in shock. But in the right context, it’s a searing way of examining the very real-world horrors perpetuated by distinctly American institutions. One of those institutions is the news, the values of which have been tested and ridiculed ad nauseum in the era of President Trump. “Fake news” is a phrase so frequently repeated that it’s barely definable, a meaningless qualifier that questions the validity of even the hardest facts. That’s perfect fodder for a season of television that prods at the recent presidential election, when “fake news” could refer to just about any media source. The latest episode of AHS: Cult, “11/9,” pokes a lot of fun at the banal competition between news personalities. Emma Roberts is delightful as the Tomi Lahren-esque Serena Belinda, with Adina Porter’s Beverly Hope as her more leveled foil. But their incipient rivalry culminates in a scene that echoes a real-world tragedy much more serious in nature: the on-air murder of Virginia reporter Alison Parker and cameraman Adam Ward. Parker, 24, and Ward, 27, were the victims of a gunman named Vester Lee Flanagan II, a former employee of their news station, WDBJ. On the morning of August 26, 2015, Flanagan interrupted a live news segment about the upcoming 50th anniversary of Smith Mountain Lake, a man-made reservoir near Roanoke. Parker was interviewing Vicki Gardner, executive director of the local chamber of commerce, when Flanagan burst onto the scene and fired several shots. Gardner was struck but survived, while Parker and Ward died on the scene, suffering wounds to the head. Parker and Ward both worked for WDBJ’s morning news show, Mornin’. Parker had worked for the station for about a year, and Ward for only one month. Both were Virginia natives and good friends. Parker’s boyfriend, Chris Hurst, was a fellow WDBJ news anchor who recently announced a run for the state legislature. Flanagan went by the on-air name Bryce Williams and had a history of professional misconduct. He was accused of verbally abusing two female coworkers at a news station in Florida, and later lost his job there due to “odd behavior.” He was fired from WDBJ in 2013 after complaints from fellow reporters that he made them feel “threatened” and "uncomfortable." After hearing the news of his dismissal, Flanagan became violent in the office, throwing a wooden cross at his boss, and was eventually escorted out by police. He later posted on Facebook and Twitter that he was racially discriminated against for being black, specifically naming Parker and Ward in his posts. Shortly after the murders, Flanagan faxed a suicide note to WDBJ, then shot himself to death in a rented car on Interstate 66 after a police pursuit. Parker and Ward’s deaths were broadcast on live television, shocking the nation. President Obama issued a statement, saying he was “heartbroken” by the incident. Parker’s father, Andy, became a spokesperson for gun violence prevention, challenging the NRA and politicians on the issue. The shooting also led to several press controversies; the New York Post and New York Daily News were condemned for posting still images from Flanagan’s phone video of the murders (which he published on Facebook and Twitter before his death), as were several British tabloids. Other outlets like CNN and NBC Nightly News aired partial clips of the shooting in segments. 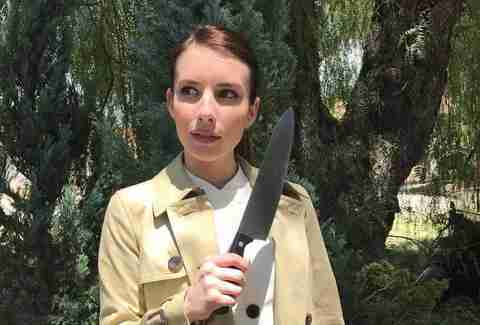 Let’s be clear: The on-camera slaying depicted on AHS: Cult is very different from this real-life incident. In their version, the cruel and vindictive Serina Belinda and her cameraman are stabbed to death by the clown cult while taping a pet adoption event. Their segment is pre-recorded, not live, and shown in graphic detail. It also winds up being semi-satirical, with the inclusion of a cute puppy who licks the camera as their bodies bleed out in the background. It brings to mind another real-world and on-air event that loosely inspired a piece of art. In 1974, journalist Christine Chubbuck shot herself to death during a live television broadcast. The infamous event was the subject of two 2016 movies: the feature film Christine and the documentary Kate Plays Christine. But Chubbuck’s suicide was also the alleged inspiration for 1976’s Network, written by Paddy Chayefsky and directed by Sidney Lumet. Network won Oscars for several of its actors and for its screenplay; it's also, like American Horror Story, a sharp satire, laying into the nature of the bloodthirsty news business -- in it, a newscaster vows to commit suicide on air to increase ratings. 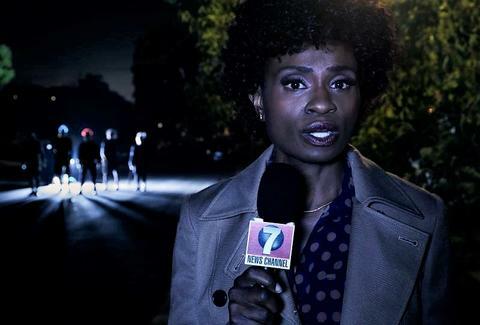 On AHS: Cult, Serina Belinda’s murder helps woo the vulnerable Beverly Hope to the clown cult and revitalizes her career in the process; with Serena out of the way, she’s able to stake a claim in the more hard-pressing stories she craved. The segment doesn’t make it to air, and is thus only tangentially related to Parker and Ward’s deaths. But it does share a certain DNA when it comes to motivation. Flanagan’s quest for visibility and revenge isn’t all that different from Beverly Hope’s. Both showcase the brutal nature of nabbing a story -- be in brutal on-air fashion for notoriety, or for one’s own career aspirations. American Horror Story may toe the line of good taste, but when reality is so cruelly shameless, can you blame it?